There’s a common belief that Finnish people are shy and that they keep to themselves. I think that this is somewhat true, but only in the beginning of a relationship. Once you get to know them, they usually turn out to be outgoing and fun to hang around with. Of course this doesn’t apply to all Finns (or other cultures, too). I find finnish people honest and trustworthy. There’s usually no bullshitting and that is probably the most important thing for me in people. Finnish people like to drink. Beer and Koskenkorva. 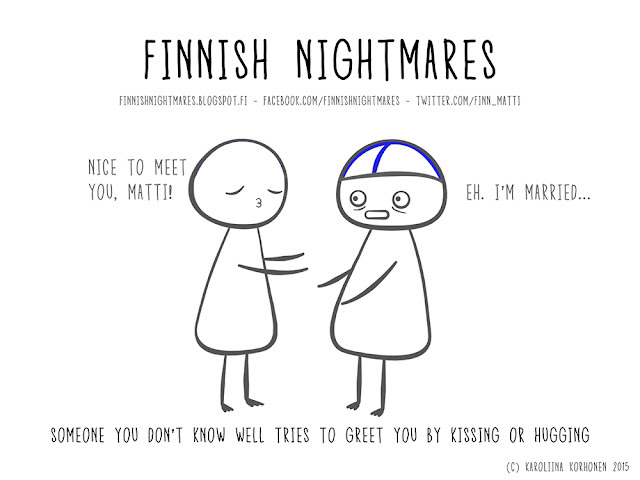 This is probably the only way people get to know each other in Finnland, well at least for me. At a party it is so easy to choose the people who you want to hang with even when they are drunk. Also in the beginning of my studies no one in our class really spoke to each other before the first party. The things most important for me in Finnland are probably the four different seasons, especially winter and summer, my summer cottage and the nature in general. I’m a person who (apart from the partying) goes alone to the cottage for the weekend, picks up mushrooms in autumn and enjoys the silence and peace. These are also the things I’ll probably miss the most during my half a year abroad, aside from friends and family. I don’t really agree with people saying we’re generally grumpy and silent nation – I find most of the Finnish people open-minded, aware and curious. Of course there are those grumpy ones who wants to cherish their own space and hates to leave their comfortzone. But then again; isn’t there those kind of people all around the world? Most of the finnish people are proud of their nation and likes to cherish finnish traditions – and who doesn’t? I’m proud of Finland aswell and I’m happy being a Finn. I find especially finnish education system, healt-care and nature the best things in Finnland. Finnish nature… oh boy! The country of thousands lakes, big forests and Northern lights! We have four season (Autumn is my ultimate favourite), only 5,3 million people, little villages and yet quite developed technology. 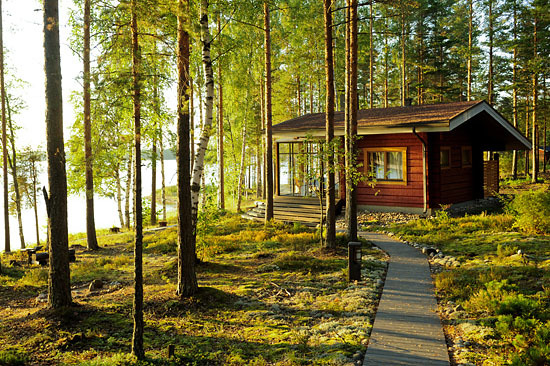 If I’d have a friend coming from foreign country, I’d totally take him to some cabin in the middle of the forest and near by lake, make him go to sauna and swim naked. All in all, being a Finn is a state of mind. I find our country a little bit insecure which we try to compensate with black humour. I definetely love Finnish sense of humour; it can be so sarcastic and self-ironic. I like that we want our own personal space – our thoughts need space to grow. And I like our shyness; we are humble – almost even martyrious- about anything we’re doing or achieved. I don’t see it as a weakness – I see it as a resource. Me, me, me. Or is it we? The Finns are commonly a very self-centred group of people. In Finland, if your neighbour has a nice car, is happily married and has a lot of disposable income you cannot feel but angry and envious about his or her life. No wonder it is commonly said that Finns would pay 100€ so that the neighbour will not receive 50€. If there was such a thing as “national emotion”, for Finns it would be envy. But when it comes to Finland receiving attention outside of Finland, whether it is success in the Olympics or a Finnish actor being cast in a minor role in a Hollywood movie, the whole country celebrates in unison. The aforementioned sentence has gained international recognition through the hundreds of thousands of times the Finns have used it in the comment sections of videos, articles and forums throughout the internet. Lately people have started using the sentence sarcastically, but there is no doubt that some people still use it non-sarcastically. The fact that the Finnish people are so proud of their home country and their own citizens, whilst still being the most envious people in the world is quite adorable in a completely nonsensical way. I mean I hate my goddamn neighbour, but his merits really show the world how great we Finns are! I guess it is a love-hate sort of thing. Just like the Finnish nature, the ordinary Finnish person is quiet, isolated and untouched by any human being. If there is something we Finns hate it is talking, being around people, and above all, getting touched by people whose personal lives we do not know anything about. I am quite sure that the average Finnish person would die if he or she had to meet up with a bunch of talkative Italians, who would all want to give him or her a kiss on the cheek when they met. The Finns are wary of things they do not know or understand, more so than humans in general. This mixed with the culture of not being very talkative, unless drunk, makes Finnish people seem very rude and even racist towards foreigners. In reality the Finns are usually very intrigued by foreigners and especially by their opinion on Finland, the Finnish people and Finnish food. Oh and “Sauna perkele!”. Even though Finns seem grumpy and disrespectful, they are very eager to help their fellow human beings. Should a foreigner be lost in Helsinki for example, they should ask a Finn for directions. The Finn will show the foreigner to his or her destination, tell a little about how we defeated the Soviets during the second world war, recommend their favourite Finnish delicacies and demand that they go to sauna with them. Bottom line is that deep down the Finns are very friendly and nice folk. You just need to lure that out of them by asking something about Finland or Finnish culture. I do honestly think that the favorite sound of the Finnish People is silence. We like it when there’s no sound and you don’t have to talk. Especially if you don’t have anything important to say you tend to keep it quiet if you’re a Finn. The Finnish nature is also quiet and really beautiful, there’s nothing quite like going to a forest in Finland and just enjoying the quietness of the forest and nature. Now some foreigners might think that it is rude for us Finns to remain silent and that we have silent gaps in our conversations, but I’d like to think that it is our way of enjoying the moment and respecting one another. I think it’s therapeutic and calming for a Finn to remain silent and one of the reasons why we tend to do it. As mentioned before the Finnish nature is beautiful. The Finnish landscape is covered mostly by coniferous taiga forests and fens, with little cultivated land. Of the total area 10% is lakes, rivers and ponds, and 78% forest. The forest consists of birch,spruce, pine and other species. If you’re lucky enough you might have the chance to experience the Northern Lights in Finland. It is a truly magical sight and one that you will remember for the rest of your life. Ah yes the sauna. A classic and a cliche but a must if you’re talking about Finnishness. The sauna is a holy place to us Finns, a place where you can relax and remove your stress and be all by yourself. In the old days sauna was used as a cure for diseases. The Finnish sauna is a substantial part of Finnish culture. There are five million inhabitants and over three million saunas in Finland – an average of one per household.Saunas are an integral part of the way of life in Finland. They are found on the shores of Finland’s numerous lakes, in private apartments, corporate headquarters.The sauna is an important part of the national identity and those who have the opportunity usually take a sauna at least once a week. The traditional sauna day is Saturday. Despite the fact that I had been in many various countries all over the world, there is no such place where I feel just as relaxed as in Finland. If you are a tourist from, say, New York, London, or Moscow, you will be astonished by the significant difference of the atmosphere of Helsinki in comparison with those capitals. During my life in Finland, I’ve never seen even a hint of rush on the streets. Finns are taking their time, peacefully working their way towards their deadlines and it is a rarity to see someone in hurry in Finland, with an exception of foreigners, perhaps. With a population of 5.439 millions of people and a size of 338,424 km², Finland retains a relatively small number of inhabitants for its area. The vast majority of the country is covered with dense forests and lakes. 78 percent of forest and 10 of lakes to be precise. Even the capital has trees all over the place, not to mention the high amount of parks, hence the exceptionally fresh air. In their brand new report, The World Health Organisation claims that the air in Finland is the third cleanest in the world. It seems as if Finnish people did not lumber their woodlands at all! Another interesting fact about Finland is that their tap water is one of the cleanest in the world and absolutely drinkable, as it’s taken from pure groundwater sources. Besides, its taste is astoundingly good too! Having all those things affecting you: the calm atmosphere of the cities, as well as the freshest air and the crystal clean water, there is a high chance to receive an urge to relax and move towards your daily targets at a slow pace, as if your whole day is a chilled stroll. There are numerous reasons to spend your winter vacation in Finland. Everyone knows that this snowy wonderland is the home of Santa! But, that’s not everything. Despite the occasional temperature drops below -20 centigrade, it doesn’t feel as cold as one may think. The dry climate of Finland would make you feel much warmer during winter than climates of the countries of central Europe. Besides, there are several guides throughout the internet that could help you to prepare for the Finnish winter, such as visitfinland.com, for instance. So, yes, there will be a thick layer of snow around, as well as shorter daylight hours, not to mention the unusually low temperatures. In other hand, there are less tourists, stunning snowy landscapes and various winter activities that could not be discovered in warmer destinations! You may go chasing down the Aurora Borealis, also called the Northern Lights, ride a husky sledge, visit a traditional sauna, or even take a selfie with Santa himself! The choice is broad. Just make sure that you’ll arrive in time to experience those events and activities that depend on snow, such as in January or February. Nevertheless, if you came here at the beginning of spring, there is still a chance to enjoy the atmosphere of winter and snow related activities with an only difference of extended daylight hours. Finnishness is something that I’m proud of. Finns are often seen as a silent and even rude people but underneath there is a loving and polite nation. I like learning about the other cultures and travelling to see the breathtakingly beautiful places around the world but what I really love is coming home. It is hard to tell people abroad what is Finnishness. You have to travel to Finland to see and feel it yourself. But there is something I can tell you about us and Finland. When I think Finland, the first thing that pop up to my mind is nature. Obviously. Nature here is just so beautiful. Finns like to go out and enjoy the nature. In summer we swim in thousands of our lakes and pick berries and in winter time we ski to ice fishing. Finland is a country that should be seen around a year. Seasons stand out here in an extraordinary way. The temperature varies from the summer + 35 degrees celsius to winter – 40 degrees. Myself I love Finnish summer but unfortunately it’s quite short if you compare it to the cold and dark winter. So if you travel to Finland, make sure you have enough clothes with you but pack also pair of shorts in case of warm days. And don’t forget to take an umbrella, there is about 200 rainy days per a year! What comes to food, Finns are extremely practical. On weekdays we like to cook a huge amount of food and eat it fast after work. If you want to cook for a Finn for example a macaroni casserole is often a good idea. Except if your dinner date is a vegetarian which is quite common nowadays in Finland also. But of course we can enjoy too. If you want to taste some Finnish goodies, I would recommend to try chocolate and especially Fazer Milk Chocolate. Another very traditional delicious dessert is a blueberry pie. What could be more Finnish than dress up a wind suit, go to a forest pick some berries and bake a pie (and of course go to sauna after eating). Finnish loves holidays. Particularly Christmas and Midsummer have a special place in our hearts. In every year we want to eat a Christmas ham and see the white snow covering the ground. Unfortunately, we often get just the first one and the snow comes in January. In Midsummer you can see how the cities settle down while people pack their goods and travel to their summer cottages to celebrate the midnight sun. Traditionally people gather to watch a Midsummer bonfire. At the end, you can’t tell about Finland without telling about sauna. Okay to be honest, not even all Finns like to have a sauna but still that is one of the most tradtional thing in Finland. I advise even to try it. If possible, the best sauna experience is in a wood-headed sauna by the lake. But if that is not at hand, an electric sauna in an apartment building is also a good option. Just make sure that you share that experience with a Finn and have a good time! The nature in Finland is beautiful and clean. Where ever you go, you’ll find forests and lakes. You wouldn’t have to travel abroad to enjoy of breathtaking landscapes, great beaches and exotic activities, we have those in Finland too. Things that tastes to me like Finland and which I will miss while being abroad are: rye bread, coffee, fresh vegetables and berries – not to forget Fazer chocolate. Speaking of food, I have to also point out Finnish school lunches which you can’t appreciate too much. It is healthy, tasty, very reasonable priced and saves Finnish students from eating noodles at every meal. This subject is close to my heart because I’m studying nursing. Finnish health care is one of the best in the world but still people complain about it a lot. Yes – waiting times can be long (but don’t worry, your health condition is being considered) and yes – you have to pay something from your own wallet (but it is just a small amount of what the care actually costs). It isn’t perfect but it sure is the best there is in the world. Not sure if you should love or hate Finnish weather. It is like a gift – you never know what you will get. It could be anything between freezing cold and burning heat. There’s four seasons in Finland but it doesn’t mean it couldn’t snow at summer. It is even possible that it’s colder on Midsummer than on Christmas. This is the reason we love out short but bright summer and enjoy it from the bottom of our hearts. How to subscribe Finnish people in generally? I think Finns are shy by nature or at least we get into new things a bit slowly. We are scared of failing and looking stupid. We are honest and straight. We don’t like to talk about feelings but if you want to small talk, the weather is the top subject.